Stained Glass Pieces Finished....England, Here I come! Earlier this week I turned 50! That's a half a century...an amazing amount of time. I am stunned because I hardly feel the years (most fortunately!). Mere words cannot adequately express the sensation: I am old; I am young. I have just begun a career in fibers....yet, I am middle aged. Time is racing out of control. So....I have a list... a plan to get me from the shock of 50 to the stun of 60! (Yes, Wanda...my sister...I, too, have a list!----Aside: Wanda has a "list" of her "lists"; she is QUEEN of list!) My list addresses the my desires. I want to be taken seriously as an artist. I want to be accepted into an international juried show(s). I want to have proper gallery representation. 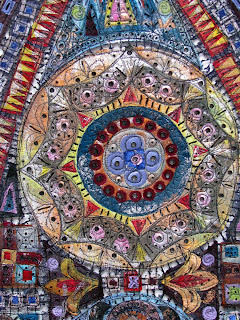 I want to be selected for another artist residency. I want to write a book and have it published and have people want to purchase it. I want to create work that touches souls...souls that I'll never personally know. I want Alex, my younger son, to be happy. This is a tall order. It is the "order of a lifetime". I have less than half my life to achieve it. Yet, this past week I've used the time allotted to me well. 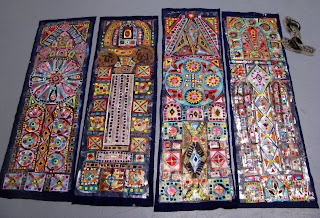 I melted the faux stained glass fiber pieces. I submitted images and my paperwork for several potential art opportunities. I wrote a "guest blog post". I entered another juried show. Plus, I'm leaving tomorrow for Manchester, UK. Steve and I will be sharing a rental apartment with our son Mathias and his girlfriend Laura-Jane. Her parents hopefully will be coming to see the ballets in which the two will be performing. With luck, I'll get to meet these nice people who have opened their home to my elder son. The time away will be special. 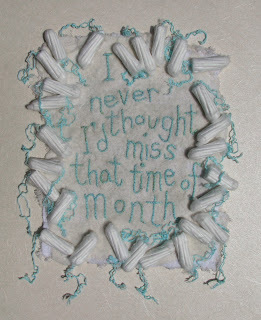 The time away will also be an opportunity to explore Liverpool and to stitch another Grave Rubbing Series quilt. 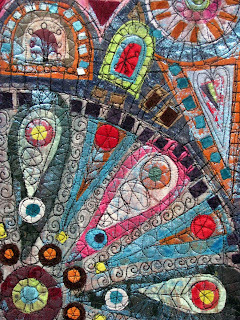 I will return with new ideas, new connections, and a new outlook on the next decade....a "mid-career fiber artist"! Just put me in a car for a seven-and-a-half to eight hour one-way drive and then back again! I love riding....looking out the window....and especially STITCHING! 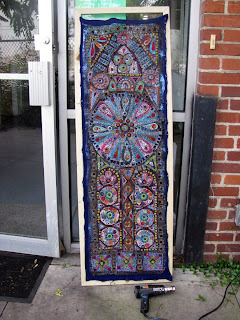 This newest piece in the Grave Rubbing Quilt series was merely basted before our trip to Washington, DC. My idea of basting is a few lines of free motion stitching...which remain. Since returning home, I added the buttons, cut a vintage tablecloth for the reverse, and buttonhole stitched the edges. Otherwise, the piece was done in the car. 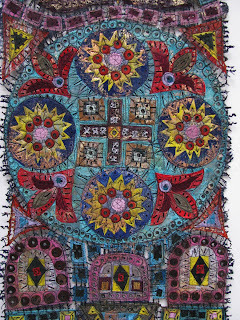 That's lots and lots of kantha stitching....running stitches that unite layers of fabric. It's very meditative. Yet, there's something missing....a proper name. I've given the image files the title "Grave" but I don't like it. Since I got such positive feedback (and an excellent name!) for another recent piece, I'm looking for names.....something like Single Stone or Unmarked or.....well....I don't know...that's why I'm asking! This series has so many possibilities and I'm already at work on the next piece. 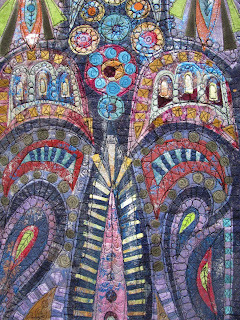 In the meantime, The Just By Faith Shall Live Again was accepted into the National Small Art Quilt Works Exhibit in Groton, NY! I'm over the moon. One more thing is now finished! Stained Glass X has been melted. Two down; four to go....plus framing. I've been experimenting with the lighting on these images. The detail shots look fine. I'm just not convinced the full view is as good as it could be. It's hard to take photos that will make the grade in juried competitions....but I'm learning! I am happy to say that a lot of work got done today. It had to get done! Very, very early tomorrow morning Steve and I are driving to Washington, DC....stopping in Rocky Mount's Imperial Center to see the national, all media juried show (including Memories, my Grave Rubbing Quilt) and also in Richmond, Virginia...so that I can collect a few more rubbings and epitaphs in Hollywood Cemetery. We're also hoping to check out a few galleries in Richmond because I'm in the process of submitting proposals for the Decision Portrait Series. All day I burned CDs and put together packets of information...resumes, a brief descriptive show proposal, a list of images, etc. I wrote cover letters, stuffed letter sized envelopes, addressed everything and kissed them goodbye at the post office. It took hours to complete twelve submissions. I have no idea if anyone will actually look at any of it. If anyone reading has an recommendation for a suitable art gallery/museum for this work, please let me know! (Yes, Chris, I sent one to the Hunterdon Art Museum! Thanks for the suggestion!) I'm also working toward getting proper gallery representation. It is unbelievable the amount of time all this paperwork takes. 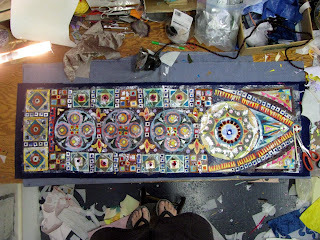 Still, I got to my studio with enough time to solder and melt the first of the "faux stained glass" fiber pieces. I'm not sure I like the final photographs yet....but there's plenty of time to take more as there's five other pieces waiting to be melted. I will NOT be showing more "melting" photos....just the finished pieces as I get them done. Today, I also pinned the next four Decision Portrait Series pieces onto the rough cut felt and deckled Thai stucco paper....so I'll be returning from a weekend in DC to plenty of new work! 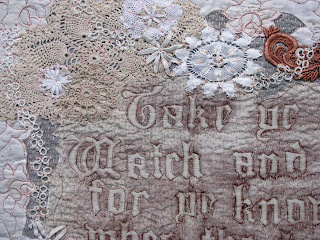 Yesterday I finished the newest piece in the Grave Rubbing Quilt Series. Unfortunately, I forgot to snap a shot of the reverse which once was a card table/bridge tablecloth. The rubbing was made in the old Warstone Lane cemetery in Birmingham, England. Most of the linens and lace were from my "stash" (which is starting to dwindle! Yikes!) 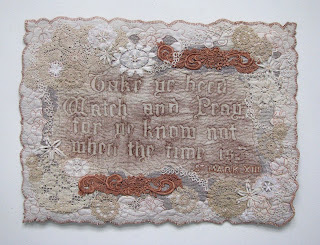 The two hand dyed pieces of lace were a gift from Linda Lynch. I hope she likes how I've put them to use! Tomorrow Steve and I are off to Washington, DC. 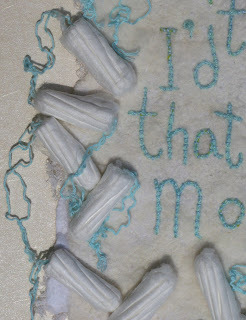 That's several wonderful hours to stitch on the next piece in this series! Ready to Solder and Melt! 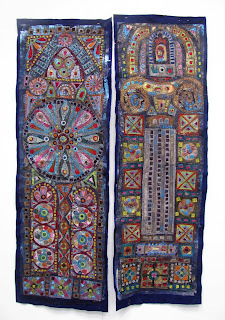 The final two "faux stained glass" fiber pieces have been free motion machine embroidered. All the sections are firmly attached to one another by the 100% cotton thread...over 5,000 yards....that's like a half-mile per piece! I'm now ready to staple each one to a stretcher bar in order to solder holes through the polyester velvet. Finally, the purple acrylic felt (substrata) will be melted from the reverse using an industrial heat gun....the type generally used to strip wallpaper. There'll be more photos coming as the work continues. 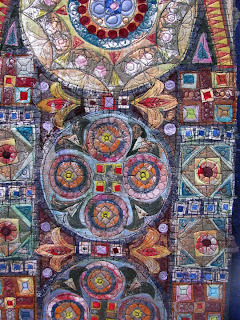 My Bernina 1630 got more than a little workout this weekend stitching the first four of six "faux stained glass" fiber pieces. 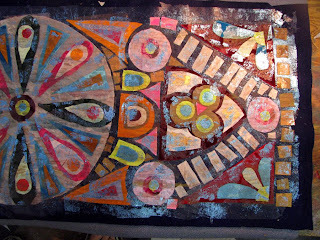 Each work is approximately 57" x 17". After constructing them with polyester stretch velvet on acrylic felt using Wonder Under (Bond-a-Web), I added some additional metallic foiling and covered each with black chiffon scarves. The chiffon works like a wash of color, unifying the otherwise garious material. It also allows the free motion foot to simply glide over the otherwise plastic feeling surface. Much of it will melt away or bond into the velvet while being heated. It took three and a half to four hours to stitch each one. 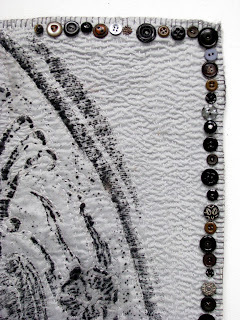 I use 100% cotton black thread and make certain that all the pieces are connected to one another. 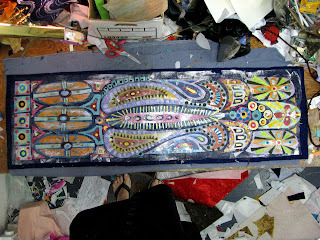 After all, once the stitching is complete, I start soldering and melting away the acrylic substrata. All the sections must be firmly stitched to one another in order that the piece doesn't fall apart! 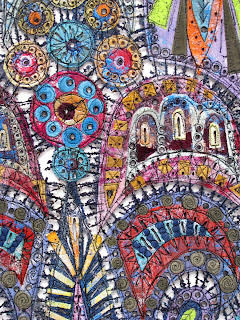 The machine embroidery, however, is more than functional....it is also part of the ornamentation.....little decorative patterns that add the detail....just like stained glass! Now....on to the final two! 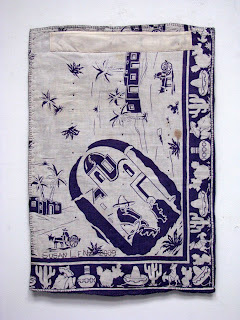 Lest anyone think I'm not continuing with my other series, I have nearly finished the next Grave Rubbing Quilt and will be transferring images for the following Decision Portraits: Patriot, Muslim, Immigrants, and At Risk Adoption. I'm still waiting to hear from two other "models".....so I've got more than enough to do! 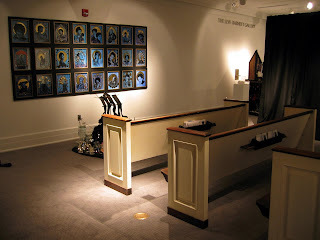 I could spend the next month (or forever) in my studio....but this coming weekend Steve and I are headed to Washington, DC to see Le Corsaire by the Bolshoi and to visit a few other cemeteries. Also, we are headed to Manchester, England on June 28 through July 6. I'd love to meet up with any fiber enthusiasts during any of these travels! One more thing.....last week I got caught! Just imagine a middle aged woman riding up to a very large, commercial dumpster in a cemetery and jumping in....fully prepared with hot pink rubber boots and latex gloves....foraging for artificial flowers. I had a lovely conversation with the administrator and, with luck, will hopefully be able to collect all the silk arrangements I need! I also drafted a legal document serving as a waiver/assumption of risk form specifically for dumpster diving. If anyone needs such a form, please email me! In the meantime, keep your fingers crossed that I get the permission and flowers I need! To this end, I've typed out all the collected epitaphs....I wanted to share them with the nice people at Shive's Funeral home, so I "buried" them on another, less used blog. The epitaphs are listed in no particular order but organized by cemetery location! Last February I thought up this piece. It's been waiting. Two days ago the time seemed right to put it altogether. 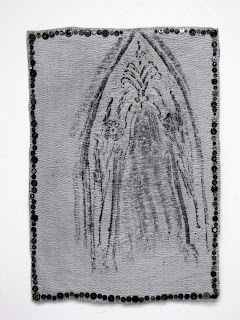 The background is a piece of embellished felt, cotton batting, cheesecloth, and bridal tulle. I had planned to stitch the words in red but the color was already there for me in the strings I'd never noticed. In two weeks I'll turn fifty. I don't feel old. I don't think old. Yet, there's no way to escape the fact that a half a century has passed since my birth. I'm stunned that this sign of aging crept up on me too! Well....I'm very thankful to Aussie Jo. I love her suggestions and will called the wrapped and nailed "figure" Aegis. It is a perfect name....just the idea I wanted! Well....enough of this "conceptualism" for a while. 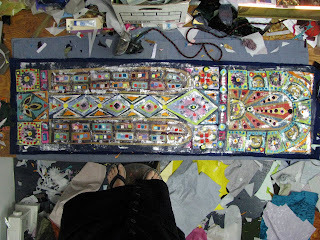 I've got another bolt of Wonder Under and my "faux stained glass" pieces are underway again! 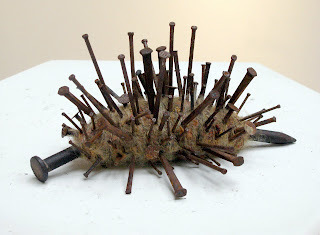 While waiting for an opportunity to buy yet another bolt of Wonder Under (Bond-a-Web), I turned my attention to a really large, old nail given to me by my neighbor Gita. I loved it from the moment I saw it and knew that I wanted to wrap it in fibers. I've wrapped all the old roof nails from Gita's house....thousands of them. 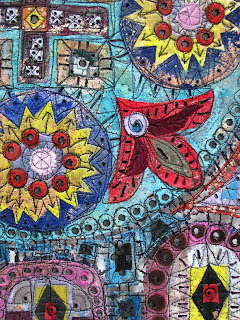 Some were in a juried show in Texas at the same time as another group was on display in Rocky Mount, North Carolina. They've graced the cover of a local magazine when CYBER FYBER was a feature story. I adore old, rusted nails. I also had an old peanutbutter jar of rusted, square nails.....so I started wrapping....and nailing...and this is what resulted. For now, I'm calling it Wrapped and Nailed. It isn't a very original name but I can't think of the term for an animal symbol...I've played around with words like bestiary, petroglyph, pictogram, hieroglyph, figure, sacrifice, totem....but I just can't seem to settle on anything. Any suggestions? And I really don't want to call it "porcupine" or "hedgehog" even though I really think those names might suit it! I'm looking for something sort of ambiguous....something that will allow a variety in interpretations. 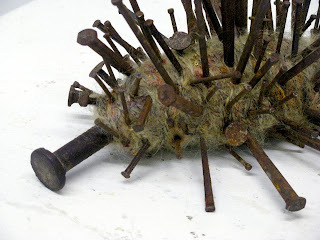 Nails are my favorite symbol: sacrifice, unity, precision....but if you get "nailed", it's generally not a "good thing"! 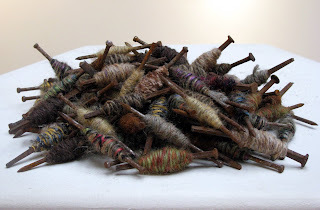 The other rusted nails are wrapped now....but I'm planning on stitching into the fibers and making these "special". I love weekends! 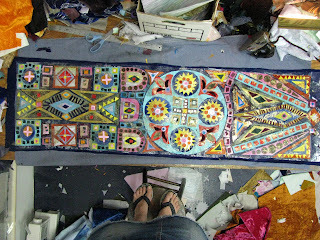 I have more uninterrupted time in my studio than at any other part of the week. 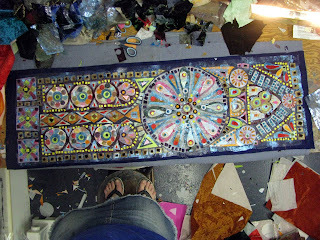 My "faux stained glass" pieces have really taken shape. In fact, five of the six have been "constructed". These are likely the worst photos I've ever posted on my blog, but they do give an idea of size, shape, and color. I took the images below while standing on my wooden stool holding the digital camera over my head. It was sort of fun trying to capture the entire piece without looking through the lens! I've got one more to "build", layer by polyester velvet layer. Then I'll be on to the free motion machine embroidery. 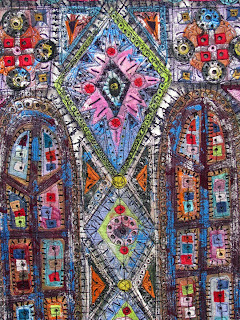 The names for these pieces are: Stained Glass IX through Stained Glass XIV. The first four were much smaller and are now owned by First Citizen's Bank here in Columbia. 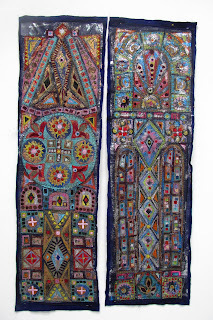 The next four were originally made for Blues Chapel and are now owned by Melle Dalton. Each time I've done this, the process gets more and more complicated and the pieces get smaller and smaller. All these pieces are constructed very similarly to my In Box Series. The only tutorial I've ever written is on how to do this. It is here! 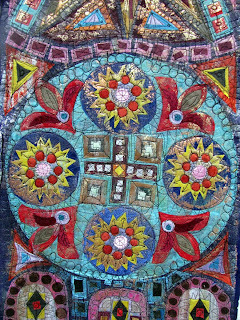 Most of the techniques I applied were learned in various classes with Jean Littlejohn and Jan Beaney. They have a saying that is often repeated: A woman can't have enough painted Wonder Under (although they generally referred to it by the English brand name, Bond-a-Web). Well, I'd like to add: A woman can't have enough Wonder Under....painted or not! This past week I've been through two bolts....that's about forty yards. Some was painted. 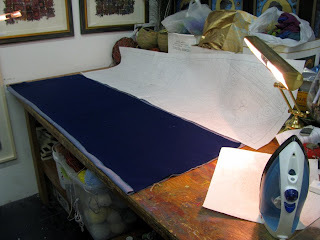 Some was ironed onto the back of the twenty or so colors of polyester, stretch velvet in my stash, and some was ironed onto the acrylic felt in order to add metallic foiling before constructing the piece. 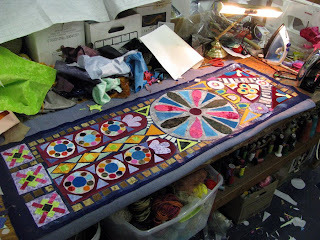 I couldn't start the final "faux stained glass" piece today....BECAUSE I'M OUT OF WONDER UNDER AGAIN! 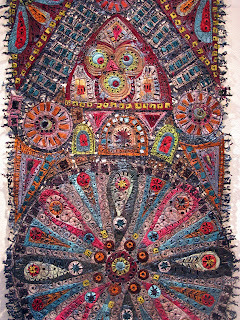 I just received the most amazing email message informing me that Father and Mother was accepted into Lowell Art Quilts 2009! 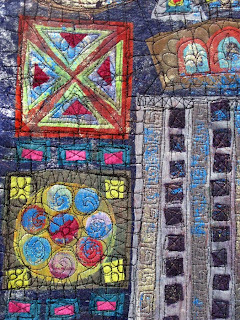 This is the first real art quilt show I've ever entered! 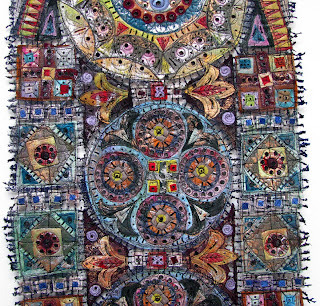 I feel now like I can actually say, "I'm a quilter"! I'm SO EXCITED!!! A year ago the Decision Portrait Series started. Since that time I've talked and written about the more than 30 finished pieces and the dozens of potential works I'd like to stitch. Frequently, I say, "This series isn't about value judgments." IT ISN'T! Yet, everyone doesn't agree with all the decisions being depicted and some of the choice made aren't exactly examples of prudent behavior. This still doesn't change anything; the series still isn't focusing on value judgments. Besides, who among us hasn't made a mistake, made a less than ideal decision? From the beginning, I planned to exhibit the entire group....and I've started submitting proposals for solo show already. 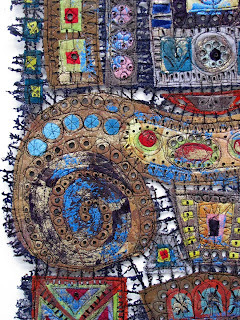 I want people to come face-to-face with the stitched xylene photo transfers....confront the myriad of complex decisions. I want people to react to the work. I want to stimulate an emotional and intellectual response. It is supposed to be thought provoking. Some of the portraits are meant to have viewers question how they might act in a similar situation. To ask, "Would I donate a kidney? Leave an abusive spouse? Take a loved one off life support?" 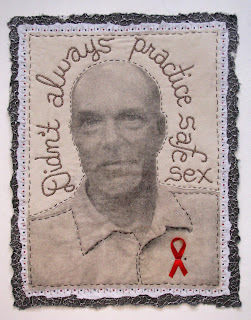 Some of the portraits, like this one, will hopefully get viewers to think about their reactions to someone else's choices: "How would I respond to an interracial couple or people with different religious beliefs or to someone admitting to a poor choice made during a passionate moment resulting in a lifetime with the HIV virus?" Well, I know exactly how I would react. I've been there. The man who posed for this portrait once worked with me. He confined his condition shortly after being diagnosed. At the time, we were best friends. I considered him the brother I never had. My reaction to his news made me care more deeply; and, for a short time, we were even closer. His medical condition certainly didn't pull us apart. There were other issues....and that's another, long story. Suffice it to say, our friendship and working relationship ended badly. I was very hurt. We didn't communicate for nearly eight year....until this portrait. Forgiveness is a powerful force. Hearing an apology did wonders for my soul. 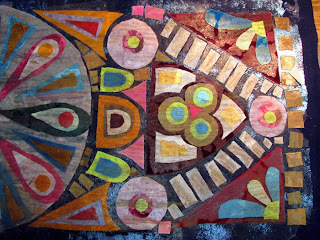 A fragile reconciliation made this artwork possible. I sincerely hope this portrait, when viewed by others, touches people as much as stitching it has touched me. 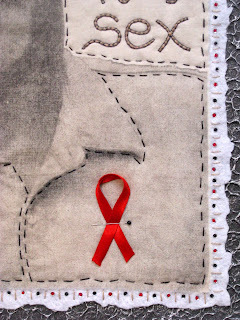 HIV affects millions worldwide. Compassion and understanding are necessary to deal with this infection. I finished this portrait several days ago. Today, Kim Lemaster came to my studio and saw the work and read the statement I'd composed. He had no problem with his name being used and suggested the MCC Clinic as a link as well at PALSS, a South Carolina organization that raises fund and awareness for the battle against Aids. (I've been a long time supporter myself and have written several blog posts about the annual Dining With Friends charity art event with which I've been involved.) It was nice to talk about art with someone I care about. Blues Chapel is going to Denton, Texas in November! This will be its fifth solo show. Each presentation has been different....bigger....better....and included new work. 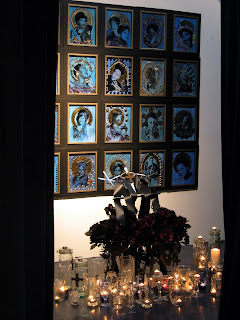 It started with just the twenty-four portraits of early female Blues singers surrounded by votive candles and a music stand with artificial roses. Black drapery created a small, private enclosure. It was the only time I could use real candles. Christmas tree twinkle lights have been used ever since. 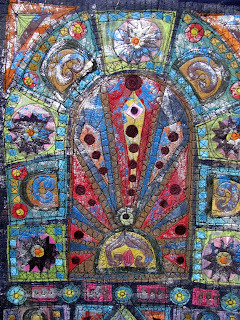 The second exhibit was at the Sumter Museum of Art, a very large, professional space. It felt like I was building a "church" instead of a chapel. 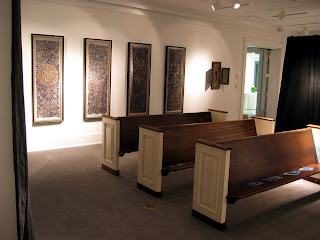 I located four church pews and made four "faux-stained glass" fiber pieces to establish a "sacred place". Of course, later I sold the four pieces. 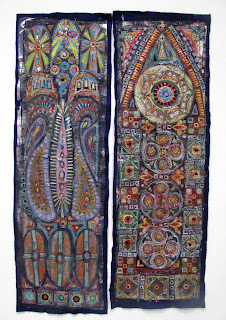 The new owner allowed me to borrow them for the exhibit last summer at the Pickens County Museum of Art (Video is here). 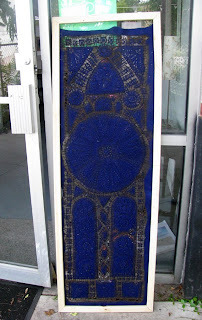 Of course the nice, new owner of the "faux-stained glass" fiber pieces said I could borrow them once again.....but....I really want six pieces. I decided to create six, totally new ones. After sketching the designs, I enlarged them on white Kraft paper to scale. This week I started the first of the six. 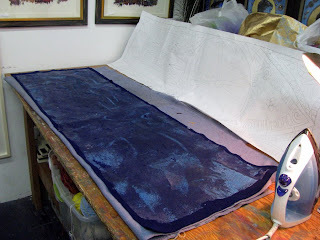 Above: Unpainted Wonder Under (Bond-a-Web) was ironed to the dark blue felt. 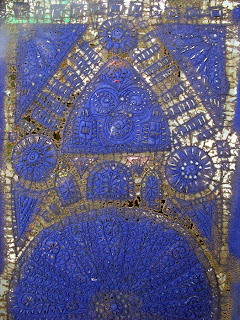 Metallic blue foil was ironed in a random fashion. Polyester stretch velvet shapes were cut and ironed in place....layer upon layer. Wonder Under (Bond-a-Web) was already ironed onto the reverse of all the polyester stretch velvet. 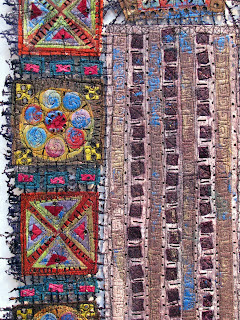 Above: Torn strips of painted Wonder Under (Bond-a-Web) are ironed over the initial layer of shapes. Above: More blue metallic foil was ironed onto the painted Wonder Under (Bond-a-Web). Smaller shapes of polyester stretch velvet were added. 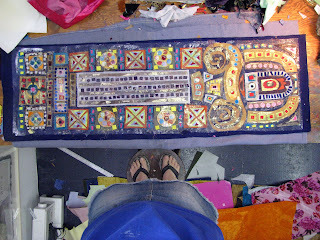 I took this photo while standing on my wooden stool.....looking down onto the piece....don't you just love my feet in the photo?! Today I'm going on the the next piece. 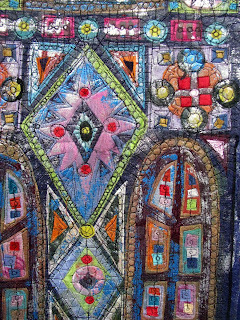 I'll construct all the "windows" before going to to the free motion embroidery, the soldering, the melting, and the framing. Of course I started this project without enough chiffon scarves from The Thread Studio.....but they are on order. Also, when I started Blues Chapel, three of the singers in the focal point were alive. Ruth Brown and Anita O'Day died later that year. Last Sunday, June 3, Koko Taylor died. She was 80. May she rest in peace.